NuFlow St. Louis is the top drain cleaning source for homes and businesses in Ladue, Missouri. We can solve slow or clogged drains no matter what the source, including household paper products, hair, grease, tree root blockage, mineral buildup, and more. We have the expertise to accurately identify the cause of your unique situation and develop an effective treatment plan for guaranteed results. The most common methods of restoring drains to optimum capacity are drain cabling and hydro jetting. Drain cabling, or the snaking tool, effectively clears away most obstructions that block sewage flow and cause backups or flooding. To complete this service, our trained technician inserts a long metal cable with a specialized tip that can chop up clog materials. The technician moves the cable through the pipe until the cutter reaches the blockage, then twists the tools until the obstruction disintegrates and rinses away. The cable is then extracted, bringing any remaining material with it for disposal. Our cable tool’s design is superior to those that can be purchased by consumers at home repair stores, and our technicians are experienced in using the tool without damaging the drains themselves, which is a significant risk when used incorrectly. You can count on NuFlow St. Louis to safely and effectively remove obstructions. 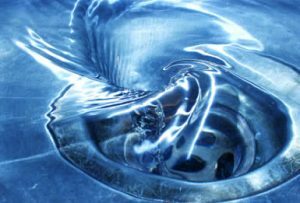 If your drain doesn’t respond to drain cabling, or if your drain has recurrent issues with blockages or flooding, we may recommend a thorough drain cleaning with our hydro jetting technology. This state-of-the-art apparatus breaks up even the most stubborn clogs and pressure-washes years of waste and mineral buildup from the walls of your pipe. We insert a flexible hose with an innovative nozzle that emits clean, eco-friendly water in 360 degrees at over 4000 PSI. The pressure is strong enough to destroy nearly any blockage, including the thick tree roots that are a common source of sewer obstructions in the Ladue area. Hydro jetting also scours away hard water scale, biological waste, paper products and corrosion that accumulate in the pipe and weaken it. As these build up, they steadily narrow the diameter of the pipe until sewer backups become a frequent occurrence. After we complete a hydro jetting service, the pipe will function like new again. Like drain cabling, hydro jetting can be destructive if used incorrectly, so every NuFlow hydro jetting technician is expertly trained to effectively and safely use this powerful tool. Annual drain cleaning is an important way to ensure that local aging sewer lines maintain their integrity for as long as possible to prevent costly sewer repairs. Pipes weakened by buildup will soon fail, but a routine drain cleaning scours away troublesome debris to extend the life of the pipe. Drain cleaning also reveals hidden signs of deterioration so a pipe can be relined before it breaks. Our affordable service takes just a couple of hours and can save you hundreds of dollars in drain repairs, so it’s an excellent addition to your maintenance routine. NuFlow St. Louis is the Ladue leader for customer satisfaction, and we’re happy to show you why local homeowners and business leaders choose us first for all their drain cleaning needs. Call today to put our expert technicians and innovative systems to work for you!